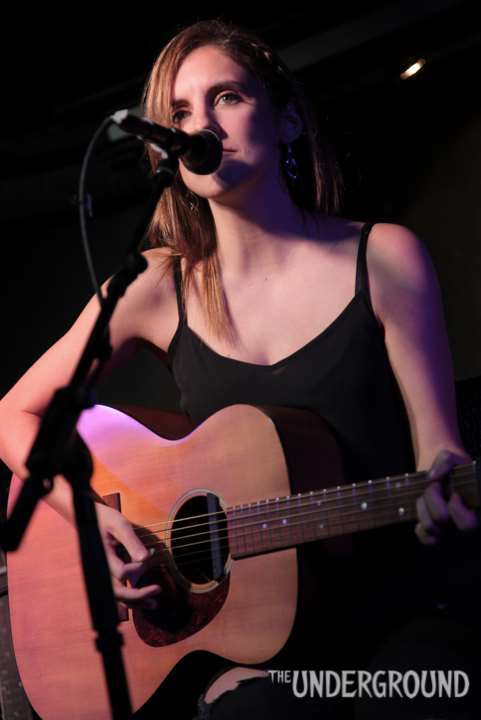 Laura Kenny, is not new on the local underground music scene. Having spent countless hours gigging around Hong Kong, playing a combo of covers and originals, she has chocked up some performance mileage that has honed a guitar tone and voice that can only be described as brilliant, sweet and so powerful at the same time. All she needs to get you moving was her voice and guitar. Opening with an upbeat acoustic version of Belinda Carlisle’s Leave a Light On, was spot on introduction to what she could do. I imagined if Ms. Carlisle was to ever do an MTV unplugged it would sound exactly like how Laura Kenny did it. A combination of energy and a bit of groove thrown in with her playing made this a lively and laid-back start to the evening. With a bit of banter aside, she launched into a ridiculously soulful rendition of Use Somebody by Kings of Leon. I have to say the sound guy nailed her mix, as it was just the right combination of reverb on her voice and guitar in the house. Having heard the Kings of Leon version too many times to mention this was a welcome change to the over produced and bit too shouty vocals from the original. 90s music is surely making a comeback and Laura Kenny’s cover of Maria McKee’s Show Me Heaven is a good reminder that people just don’t write songs that good no more. It was a great song choice, as it showcases Kenny’s full range as a musician. She’s got this song in a Tom Petty/Melissa Etheridge vibe and her vocal styling coupled with her guitar playing and that hot Scottish accent made it so enjoyable. I think the song wasn’t as familiar in the room, but no matter, as every single person still hung on her ever word and chord. Though the night was supposed to be all about cover songs, a few bands were able to sneak in a few originals. Let’s Go marked Laura’s own foray into original music territory and a slight tonal deviation from the evening, as she brought on a drummer, who happened to be the producer of her forthcoming album. It was a super cool track, a bit of Jack Johnson in its vibe with a bit more energy and edge. The drums did help bring a bit more dynamics to the track and makes me curious to hear the full song when her album is released. After that though, it was back to the covers and arguable one of the more popular songs of the set. Maybe it was the Scottish connection, or the ridiculously large contingent she brought with her, but her version of 500 miles by The Proclaimers was definitely a crowd pleaser. She slowed it down, and turned it into a ballad. Almost to a point where you felt her singing from the perspective of a person who lost a partner and wished he/she could do the things they sung about for him/her. Kinda like how Bon Jovi’s “Always” goes, without the overwrought lyrics and ever emphasised vibrato. For her last song, she unleashed on us a very acoustic rendition of Whitesnake’s Here I Go Again. Normally a rousing 80s track, But armed with only a acoustic, she did her Laura Kenny thing and turned into a up tempo folk song. Without all the electric guitars and drums, it took almost all the verse for some people to figure out the song, but for the few of us who knew the song, I could see were all singing along. The local people who didn’t know who she was when she started but by the end of her set were fans of her. I know I was and am looking forward that album and to see what she will do in the near future. Laura Kenny was a trooper Saturday night. She warmed up the stage with a charismatic and down-to-earth performance, fittingly singing the lyrics “I’ll just go on and drive”. Despite having been sick for a couple of days, the singer-songwriter (accompanied briefly by Danielle Vita on the violin) powered through to give us some nicely blended folk tunes and stellar vocals, high notes and all. Not only did she offer us a beautifully crisp and clear sound but she also easily managed to dissolve the barrier between stage and audience with a charming sense of humour.